Why Does Rhode Island Have "Island" in the Name When It is Not One? Why Does Rhode Island Have “Island” in the Name When It is Not One? Aaron asks: Why is Rhode Island called an island when it is not? 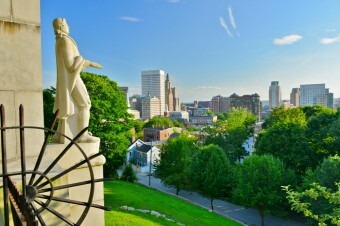 Most think the history of Rhode Island starts with Roger Williams, but the state’s “discovery” (at least by Europeans) dates back about hundred years before that to approximately 1524 and the Italian explorer Giovanni da Verrazzano (though he did most of his exploring in the name of King Francis I of France, rather than in the name of Italy). Originally making his way to Florida in an effort to find a sea route to the Pacific Ocean and trade passage to Asia, he was forced to stop at Cape Fear, North Carolina owing to the need for ship repairs. After the repairs were complete, instead of continuing further south, he decided to head north. Verrazzano made his way past the Hudson River, Long Island, and New York Bay, before reaching Narragansett Bay, a bay that opens into the north side of the modern-day Rhode Island Sound. There, he was received by a delegation of Wampanoag people. Later, this Native American tribe would be decimated by field fever (See: Why Native Americans Didn’t Wipe Out Europeans With Diseases), often carried by rodents that made their way to the New World on the boats from Europe, and then King Philip’s War. By the end of the 17th century, most of Wampanoag people were either dead or had been sold into slavery. Though, Verrazzano actually named the island “Luisa” after the Queen Mother of France, his letter comparing the size of this small island he observed to the beautiful island of Rhodes in Greece stuck. Verrazzano’s letter, for almost one hundred years, was one of the only written descriptions in Europe dealing with this specific part of the New World. The letter was printed in Italian in 1556, then in English in 1582, and reprinted at the turn of the 17th century in order to be accessible to those thinking of their own passage to the New World. It is debated what island Verrazzano actually was referring to. For years, it was thought that he was talking about “Aquethneck Island” (named by the Wampanoag), now commonly called Aquidneck Island. This is the largest island in Narragansett Bay and part of the state of Rhode Island as well as officially being named Rhode Island. That said, today many scholars believe he was referring to the modern-day Block Island, which is also part of the state of Rhode Island. Either way, when the English, more specifically Roger Williams, arrived in the 17th century, they thought it was Aquetheneck Island that he was referring too. Also around this time, he began missionary work with the local natives. Soon, he realized that what the European people were doing to these native peoples, taking their land without proper compensation, was wrong. By December of 1632, he was writing openly against the King’s charters and the perceived right Plymouth had to the land. As one could imagine, this did not sit well with the powers that be. He continued to speak out against the church and state’s affiliation and in 1635, he was convicted of heresy and sedition and banished from the settlement. In the winter of 1635, Williams and a group of followers hiked 105 miles until they arrived at Narragansett Bay, where they were met by the ever-friendly and not-yet-decimated Wampanoag people, who provided them shelter. A few months later, Williams offered the local peoples goods in trade for some of the land. They accepted and “Providence Plantation” was born, named so because Williams believed he was in the protective care of God. On July 15, 1663, English King Charles II granted a Royal Charter to the colony, “by the name of The Governor and Company of the English Colony of Rhode-Island and Providence Plantations.” Eventually the name of the region was colloquially shortened to just “Rhode Island,” despite the main part not being an island at all. That said, officially the full name is still very nearly the same as it was in 1663: “State of Rhode Island and Providence Plantations.” In 2009, a referendum was put to the voters to change the name, getting rid of the “Plantations” part, but was overwhelmingly voted down. 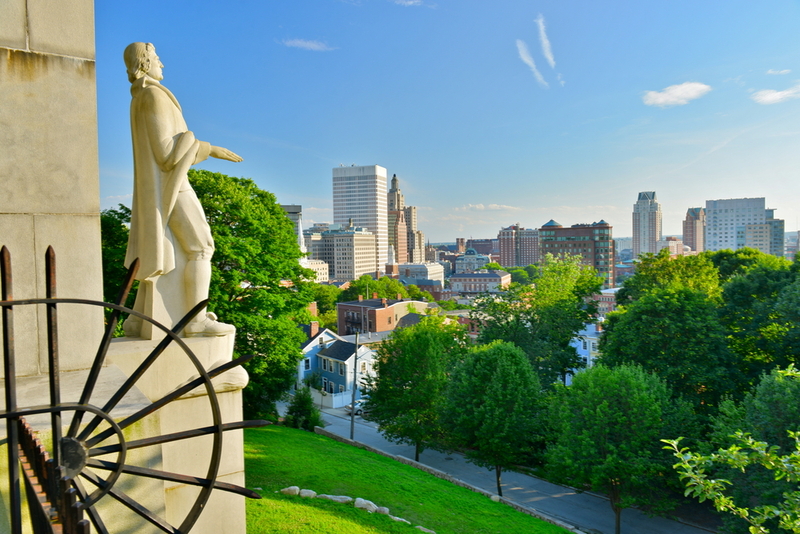 While the preceding is the better documented theory as to how Rhode Island got its name, there are other theories out there. As Volume 1 of The Proceedings of the American Antiquarian Society first published in 1880 puts it “the origin of the name of Rhode Island is quite obscure.” The volume goes on to claim that it was possible the name was derived from the Dutch “roode eylandt,” meaning “red island” supposedly due to the red clay that dotted its shores. In fact, the Library of Congress backs up this possible theory as well as the office of the Secretary of State of Rhode Island. That said, the Dutch explorer Adriaen Block visited Narragansett Bay around 1614 (and published about it a decade later) and called it red island. However, this was nearly a century after Verrazzano whose letter references “the Ilande of the Rodes”, something widely read by leaders of groups settling and traveling near the region as they planned their voyages. So, it’s hard to believe that the later Dutch name was the true origin, though Dutch maps did for a short time in the mid-17th century refer to it as “Roodt Eylant.” However, as Williams stated, “called by us Rode Island,” referencing the Greek Island of Rhodes, not the Dutch “Roodt.” Of course, it’s always also possible it’s not an either/or thing, but both, with the combination of the Dutch referring to it as Roodt, and the English settlers “Rodes” both influencing the name switching from the original “Aquethneck” to what it is today. The Proceedings of the American Antiquarian Society also speculate it could have been named Rhode Island due it being a “harbor island” or road in the ocean. They also theorizes that it could be named after a “Rhodes” family, after such a family was found in the researcher’s own digging into the early history of the state. Says the document, “Could not one Mr. Rhodes have been among of the first English settlers?” Regardless of whether he was or not, earlier documented evidence would seem to imply the Verrazzano letter theory is the most likely of the bunch.